I spoke to a local elementary Parent Teacher Association yesterday. 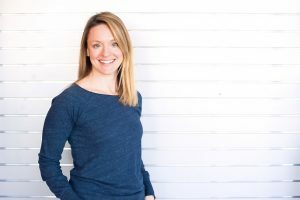 While many of the parents were excited to learn how to teach healthy eating to their children, the main concern was what to feed them after-school. I know my own kids tend to be “hangry” (hungry+angry) come 3pm every day. (Me too!) Healthy snack choices are pretty universal for kids and adults. We all like variety and often become frustrated by the same-old, same-old options. Snacks should have a small amount of healthy fat. Nut-butters, cheese, chick peas, and eggs are examples of proteins with healthy fats. Snacks should be rich in fiber and complex carbohydrates. Fruits, vegetables or whole grains combined with lean protein equals the perfect snack. Snacks should be low in sugar. High sugar foods spike blood sugar and lead to crashes. A healthy snack will be high in protein and fiber which slow the absorption of sugar into our bloodstream. Snacks should be real food. Leave trans-fats, high fructose corn syrup and artificial things (flavors, colors, sweeteners) out of your snacks and out of your diet! 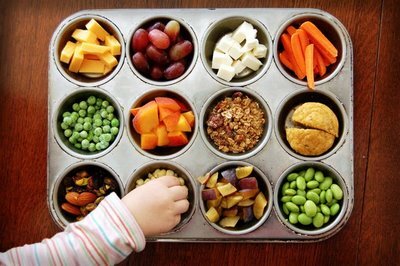 Filling up muffin tins or ice cube trays are a great way to add variety to your preschooler’s diet and still allowing them to exercise some control over what they eat. (Maybe try a 6 cup muffin tin. The 12 cup would feed a small toddler army!) For older kids/teens: leave a fruit bowl on the counter and easily accessible and have a snack section in your refrigerator. Don’t bring the bad stuff home. No one can eat what isn’t there. There are many websites and blogs with healthy snack ideas. If you find some ideas/recipes you want to try (homemade granola bars, fruit leathers, dips, etc.) now you can match them up to the guidelines and make an informed decision. What are your favorite after-school snacks?